Sri City, March 24, 2017:- A one-day Conference on the theme ‘Transformation of Employment & Social Security Laws’ was held here by the Employers’ Federation of Southern India, Andhra Pradesh & Telangana States (EFSI-AP&TS) Branch, Hyderabad in association with Sri City on Friday. 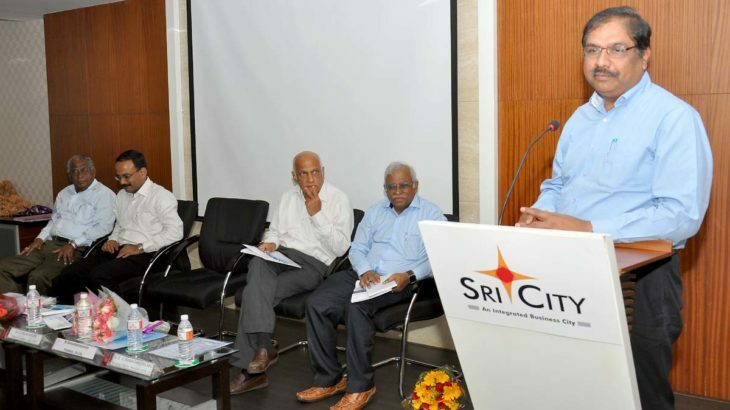 Mr. G.Balakishore, Director of Factories, Andhra Pradesh and Mr. Ramesh Subramaniam, President, Sri City Foundation were the chief guests of the inaugural session. “I am sure, the conclave provides a great opportunity for all the stakeholders to share and exchange ideas and interact with each other,” he added. The conference was held in three technical sessions, encompassing – Factories Act, Employees Provident Fund and Employees State Insurance, amendments in labour laws, employee-employer relations, personal taxation, etc., The faculty included Mr. Balakrishna Naik, Regional PF Commissioner, Kadapa, Mr. Priyaranjan Dash, Regional Director, ESI, Vijayawada, Mr. S.V.Ramachandra Rao, MD, Resource Inputs Ltd., Hyderabad, Mr. Niranjan Rao, Advocate, High court, Hyderabad, Mr. K. Nandakumar, Partner, First Principles, Hyderabad, and Mr. C.A. Sureshbabu, Managing Partner, SBS & Company. Altogether about 100 delegates attended the conference. They included Heads of HR Dept., and senior management personnel of the industrial units of Sri City and HR officials of a few companies from the neighbouring districts of AP, and Hyderabad. Mr. S.L.N. Murthy, Honorary Secretary EFSI-AP&TS, Hyderabad, and Mr. A. Sanyasi Rao, were the comperes of the event.